Disclosure: Leslie Kane, MA, has disclosed no relevant financial relationships. How Are You Coping with Income Changes? Join the discussion. 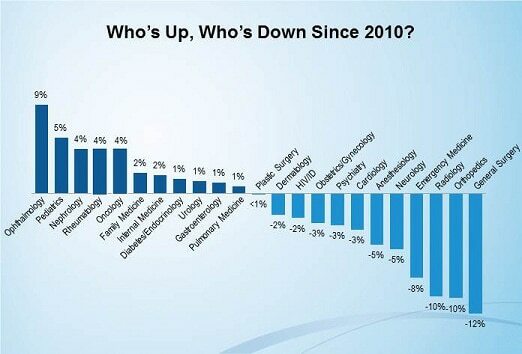 Physician income declined in general, although the top-earning specialties remained the same as in Medscape's 2011 survey. In 2012, radiologists and orthopedic surgeons topped the list at $315,000, followed by cardiologists ($314,000), anesthesiologists ($309,000), and urologists ($309,000). Previously, radiologists and orthopedic surgeons led the pack, at a mean income of $350,000 each, followed by anesthesiologists and cardiologists (both at $325,000). The bottom-earning specialties in 2012's survey were pediatrics, family medicine, and internal medicine. 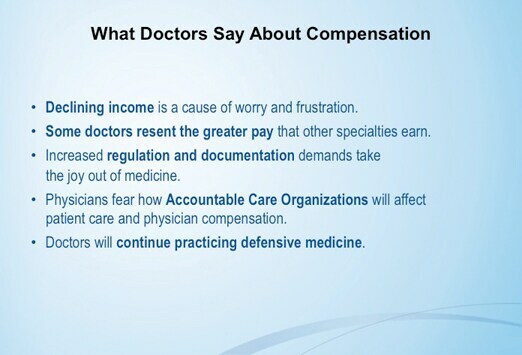 For employed physicians, compensation includes salary, bonus, and profit-sharing contributions. For partners, compensation includes earnings after tax-deductible business expenses but before income tax. Compensation excludes non-patient-related activities (eg, expert witness fees, speaking engagements, and product sales). Although decreased reimbursement has been the recent buzz-phrase, some specialties saw modest gains, whereas others saw significant declines. The biggest income increases were in ophthalmology (+9%), pediatrics (+5%), nephrology (+4%), rheumatology (+4%), and oncology (+4%). For declines, the largest were in general surgery (-12%), orthopedic surgery (-10%), radiology (-10%), and emergency medicine (-8%). 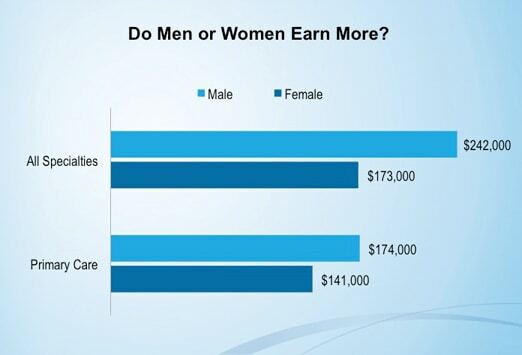 Male physicians across all specialties earned about 40% more than female physicians. In primary care, men earned 23% more. Those figures are fairly consistent with Medscape's 2011 survey data. However, the gap in income is narrower in some specialties. Male obstetricians/gynecologists earned about 12% more than their female counterparts in 2012, and male pathologists earned about 8% more than females. "The income gap is closing in primary care as well," said Tommy Bohannon, divisional vice president of hospital-based recruiting for Merritt Hawkins, a physician-recruiting company. "Many women doctors choose to work fewer hours for quality-of-life reasons. But that's true of younger male doctors as well. That's why the disparity in income will narrow." 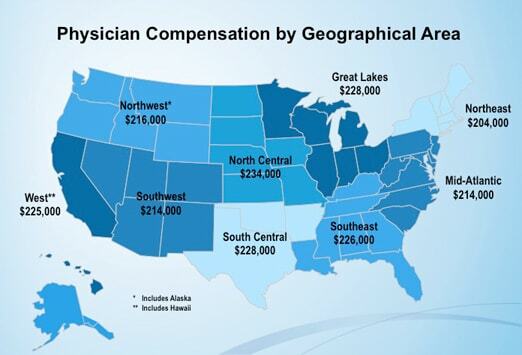 As in Medscape's 2011 survey, the highest-earning physicians practice in the North Central region, comprising Iowa, Missouri, Kansas, Nebraska, and South and North Dakota; the mean income of physicians there is $234,000. The next-highest earners were doctors in the Great Lakes region ($228,000). 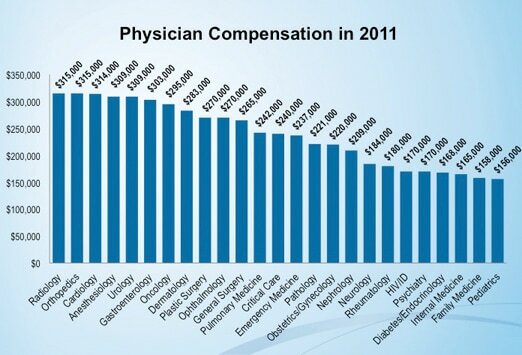 Physicians in the Northeast earned the least, at a mean of $204,000. "There's less competition among physicians in smaller communities and rural areas," says Bohannon. "There isn't that same downward pressure on reimbursement that you have in metropolitan areas. Generally, smaller communities have to pay more to attract physicians." Don't write off private practice! Although physicians are rushing toward employment, partners in private practice far outearned physicians in any other work environment. 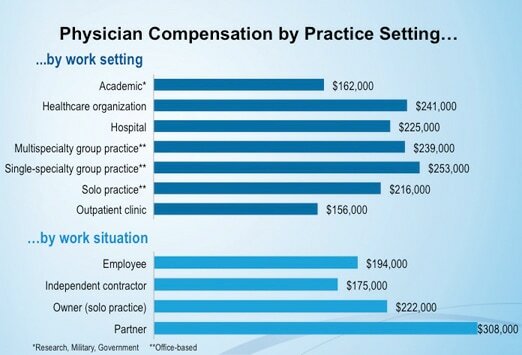 For physician respondents overall, partners in private practice earned a mean of $308,000. Solo-practice owners earned a mean of $222,000, while employed physicians earned a mean of $194,000. "Owners of practices are busier than hospital-employed doctors," said Bohannon. "Medium-sized groups do well because of economies of scale and greater bargaining power with health plans." Apparently, it's worth the hours and money required to become board certified. 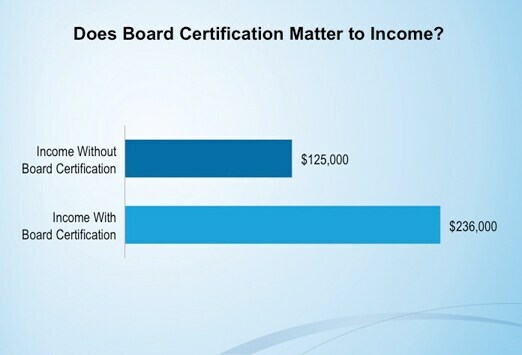 Physicians who are board certified earned a mean of $236,000; that's 89% more than non-board-certified doctors, who earned a mean of $125,000. Board certification has great impact on more than just compensation. It is often required for inclusion in health plans and for hospital privileges. "As patients are becoming savvier, they research physicians' backgrounds. Board certification becomes more important," said Bohannon. 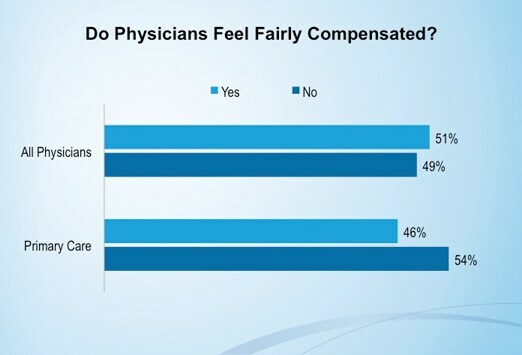 Physicians overall are nearly evenly split about whether they feel fairly compensated: 51% said yes, 49% no. 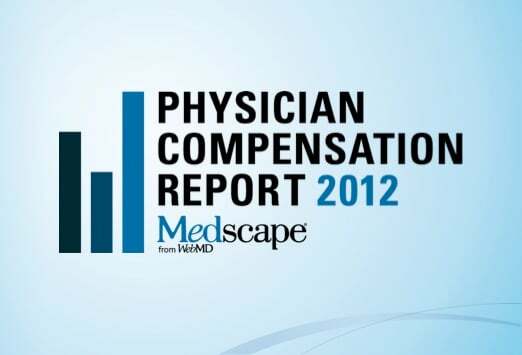 Those figures are nearly identical to Medscape's 2011 compensation survey. However, among primary care physicians, a slight majority (54%) in the 2012 survey said they weren't being fairly compensated. "The elective side of plastic surgery has been hit hard by the economy," said Bohannon. "General surgeons have long felt dissatisfied compared with higher-earning surgeons. They take more call, deal with more life-threatening situations, and generally earn less among surgeons." The "rich doctor" myth may be just that (although "rich" is relative). Overall, only about 11% of physicians said that they consider themselves rich, while 45% said that their income is no better than that of many nonphysicians. Another 45% said that although their income probably qualifies them as rich, they have so many debts and expenses that they don't feel rich. 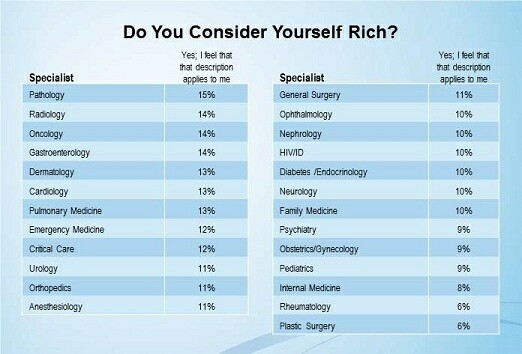 The specialties with the highest percentage of physicians who consider themselves rich were pathology (15%), radiology, oncology and gastroenterology (14% in each). Even among some of the higher-earning specialties, a majority of anesthesiologists, critical care specialists, dermatologists, urologists, and emergency medicine doctors said that they don't feel rich because of debts and expenses. About 3 in 10 physicians (31%) spend 30-40 hours per week in direct patient care, a slightly higher percentage than in Medscape's 2011 survey. One quarter of critical care specialists spend more than 65 hours per week seeing patients, as do 11% of general surgeons and cardiologists and 10% of internists and nephrologists. About one quarter of pediatricians, rheumatologists, and family physicians spend less than 30 hours per week in direct patient care. 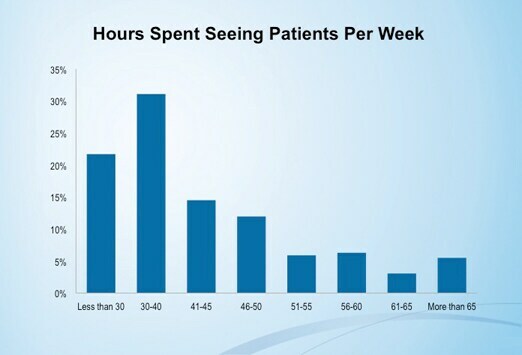 Just less than one third (29%) of all physicians see 50-99 patients per week. In the 2011 survey, about 40% of doctors saw that many patients per week. About 23% of physicians see 100-174 patients per week. 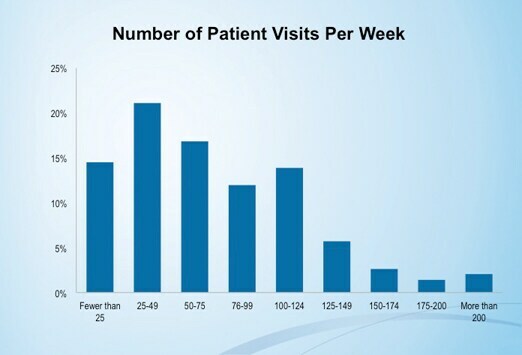 Radiologists have the most patient visits: One in 5 sees more than 200 patients per week. 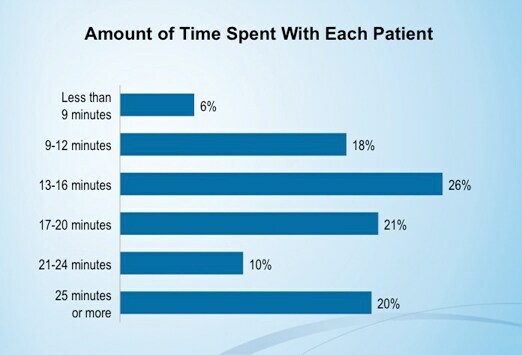 As in Medscape's 2011 survey, the 13- to 16-minute patient visit is still the most common, especially in the primary care specialties of family medicine and internal medicine. Anesthesiologists (49%), critical care physicians (44%), and neurologists (46%) spend more time with each patient: a mean of 25 minutes or more. A majority of dermatologists (40%), radiologists (8%), ophthalmologists (35%), and emergency physicians (35%) spend the least time -- a mean of 9-12 minutes per encounter. The amount of time per patient visit excludes the patient's time with a nurse practitioner, physician assistant, or medical assistant; it measures only time spent in the presence of a physician. These data do not include psychiatrists. While female physicians still generally spend more time with each patient than do male physicians, the gap has narrowed. 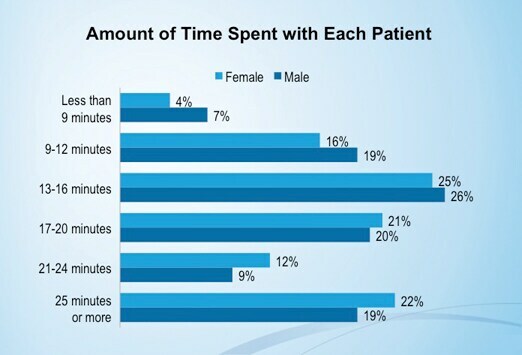 Roughly 45% of both genders spend 13-20 minutes per patient visit. Whereas 7% of male physicians spend less than 9 minutes per patient visit, only 4% of female doctors do the same. "Female physicians tend to concentrate in obstetrics and primary care, where doctors naturally spend more time with patients than do other specialists," said Bohannon. "Often, they are part-time employees for lifestyle reasons, and their main priority isn't on maximizing revenue for the practice. So, they are able to spend more time with patients." More than half of physicians spend a minimum amount of time - 4 hours or less - on paperwork and other administrative activities. 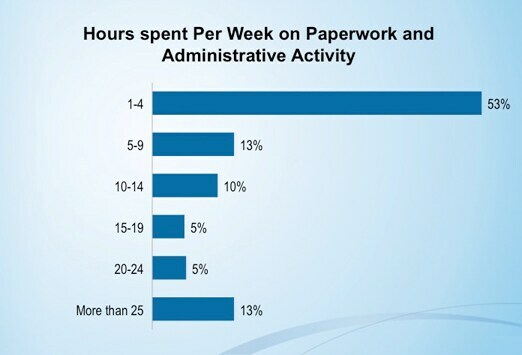 Another 23% spend from 5 to 14 hours per week on administrative work. HIV/AIDS physicians (27%) spend at least 25 hours per week, followed by pathologists (33%) and oncologists (18%). Only 10% of family physicians, internists, and pediatricians spend that much time on administrative activity. "More documentation is being required than ever before, and paperwork demands have definitely increased," says Bohannon. Physician frustration is growing. 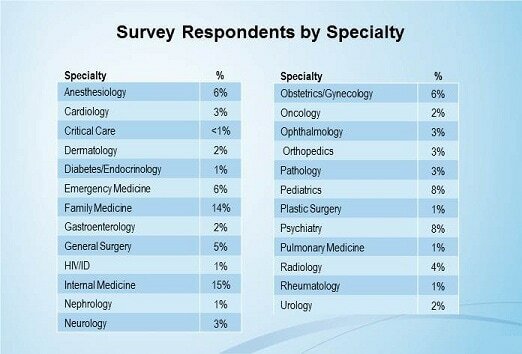 The 2012 survey showed far more dissatisfaction among doctors across all specialties. 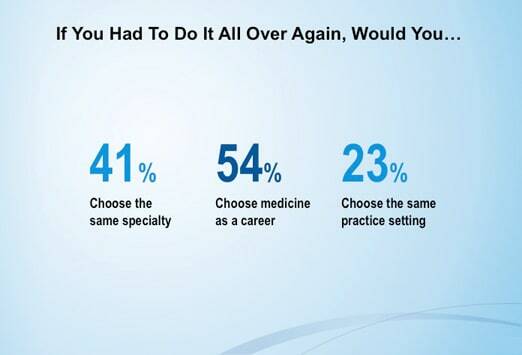 In 2012, just over one half of all physicians (54%) would choose medicine again as a career, far less than in the prior year (69%). Only one quarter of internists and one third of family physicians would choose the same specialty. Despite lower incomes, 46% of pediatricians would still choose that specialty. About 23% of all doctors would choose the same practice setting, compared with 50% a year ago. There was little difference in attitude between male and female physicians. The most frustrated with their specialties were internists and family physicians. What a difference a year makes! Last year's satisfaction scores hit 80% (dermatologists), with many other specialties over 70% (radiologists and oncologists) and several over 60%. 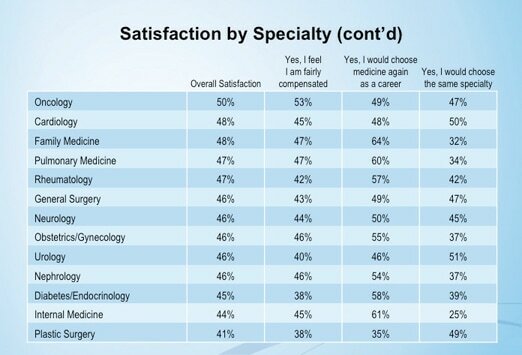 In Medscape's 2012 survey, however, there are fewer smiles. The most satisfied specialty is again dermatology, but this time with a satisfaction score of 64% -- considerably down from 80%. 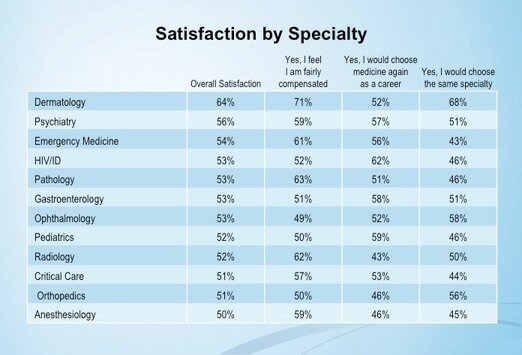 Close to half the specialties surveyed scored under 50% in overall satisfaction. The most discontented were plastic surgeons; only 41% said that they were satisfied overall. Internists (44%) and endocrinologists (45%) also expressed lower levels of satisfaction. 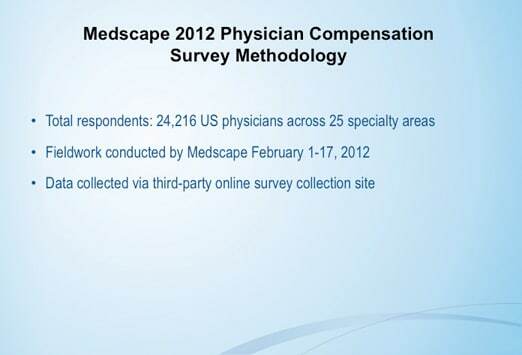 More than 3200 physicians commented on different aspects of Medscape's survey. Their remarks illuminated the frustrations in the profession. "My income is 60% of what it was 10 years ago, and I'm doing more work." "I feel fairly compensated, but I am a little jealous of the vast difference between my salary as a primary care physician and what my specialist counterparts are earning." "The regulatory environment and the onerous paperwork involved are making the current situation untenable." "I love being a physician, but I hate what is happening to medicine. Too many people are coming between me and the care I provide to my patients." Despite the interest in alternative patient-care delivery models, only a small percentage of physicians are currently involved. About 3% participate in Accountable Care Organizations (ACOs), but 5% say they plan to become involved in the coming year. "ACOs are still too new to have a large impact, but that could change soon," says Bohannon. Some 3% of physicians have cash-only practices, although that percentage is higher for plastic surgeons (15%) and psychiatrists (11%). Typically, such practices are found more in primary care than in specialties. Only 1% of physician respondents practice concierge medicine. An ACO is a type of payment and delivery model that ties provider reimbursement to quality metrics and reduction in the total cost of care for an assigned patient population. 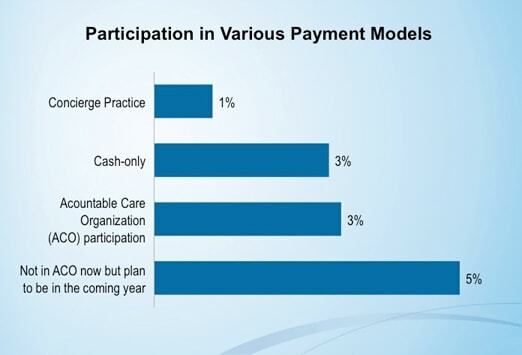 An ACO may initiate bundling of payments for various clinical outcomes. 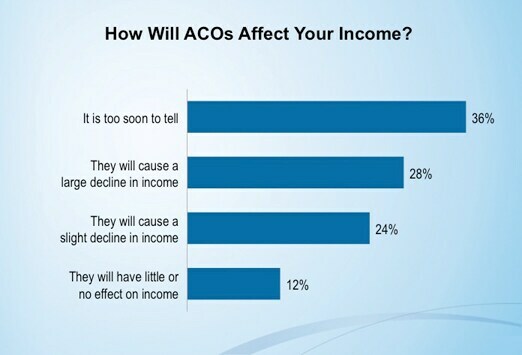 Whereas 52% of physicians we surveyed believe that ACOs will cause a decline in income, 12% say that they will have little or no effect on income. "Most people are averse to change, and doctors are the same," says Bohannon. "Until more ACOs are up and running, you can expect resistance and skepticism." Elements of healthcare reform entail following treatment and quality guidelines set by insurers and Medicare for shared savings programs, but physicians are clearly skeptical that they will improve patients' quality of care. Almost half of physicians surveyed (47%) said these measures will have a negative impact, whereas 29% said it will have no impact on quality. Only 25% of physicians believe it will lead to better-quality care. 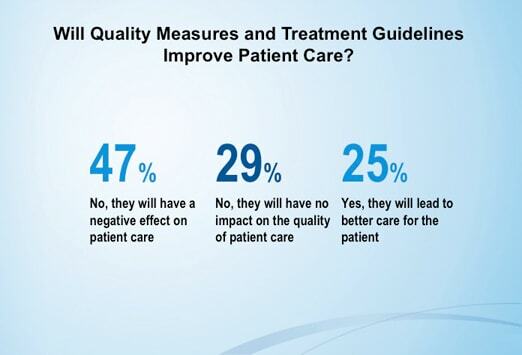 Between 26% and 31% of internists, family physicians and pediatricians say that quality measures and treatment guidelines will have a positive effect. "No physician likes being told how to treat patients," says Bohannon. "They fear that guidelines are promoted for cost-cutting reasons rather than the patient's best interest. Physicians already give up so much autonomy going from a profession that was mainly private practice to one where they're more likely to be employed. They see the guidelines as a greater loss of autonomy." 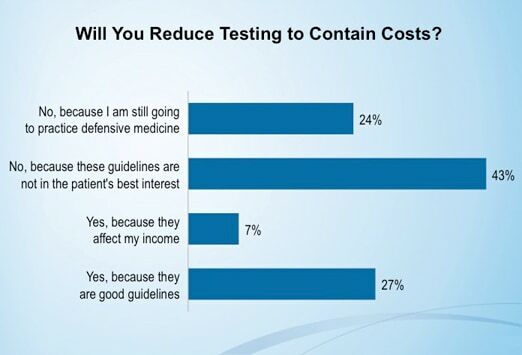 The healthcare reform goal of reducing "unnecessary care" faces challenges: The vast majority (67%) of physicians said they won't reduce the amount of tests, procedures, and treatments they perform, either because the guidelines aren't in their patients' best interests or because of the need to practice defensive medicine. Only about a quarter of doctors (27%) said that they would reduce the number of tests and procedures because the guidelines are valid. In the past, most doctors did not discuss treatment costs with patients, but times have changed. Overall, doctors now talk about more than clinical treatment with patients. Just over one third of physicians (38%) regularly discuss the issue with patients. 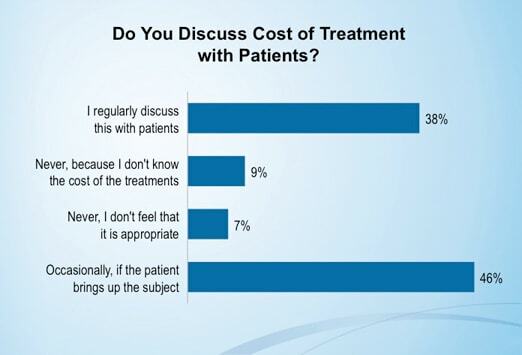 Almost one half of physicians (46%) said they occasionally discuss cost of care issues if patients raise the subject. About 1 in 7 doctors (16%) say they never discuss the issue, either because they themselves don't know the cost of the treatments or they don't believe it is appropriate to do so. The specialists most likely to have cost-related conversations are rheumatologists, psychiatrists, family physicians, and dermatologists. "As more physicians become employees, they feel that it's their responsibility to treat the patient's problem, rather than worry about the payment issues," says Bohannon. "The cost issue is a secondary concern for them. They're more likely to discuss cost for elective treatments, though." Some 68% of physicians who responded to this survey are male, and 32% are female. About 42% of respondents were under age 45. 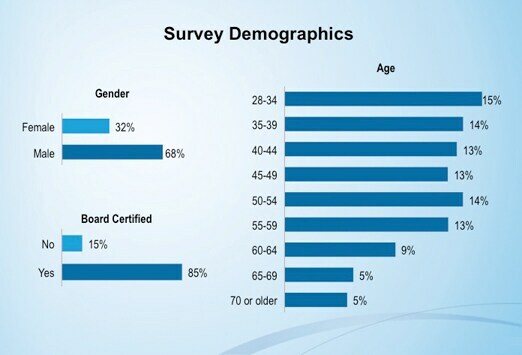 The majority (85%) of respondents are board certified. At least 40% of respondents were employed physicians at hospitals, healthcare organizations, private practices, or academia, government, and research. The largest percentage of survey respondents were in internal medicine and family medicine, followed by pediatrics, anesthesiology, psychiatry, emergency medicine, and obstetrics/gynecology. The survey's collection timeline spanned February 1, 2011, through February 17, 2011. Demographic/attitudinal weighting was not applied to tabulation because the survey was of physicians with a similar demographic profile. In some cases, small sample size may skew the results. However, the overall number of responses by specialty mirrors the American Medical Association breakdown. 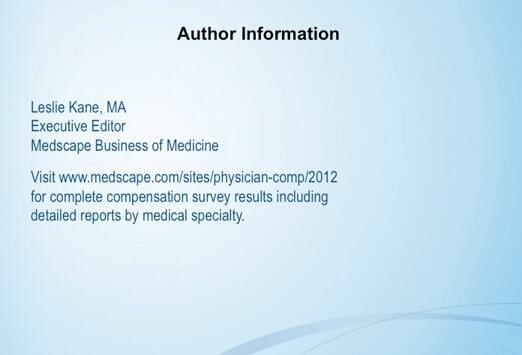 Compensation data are represented by the mean reported figures. Disclosure: Mark Crane has disclosed no relevant financial relationships.